Protect your car\'s cargo from unnecessary dirt or spillage. Perfect to buy the perfect vehicle all the weather design - trap loose soil, mud and water these rubber pads can be easily adjusted to accommodate the pedal placement and any necessary customization. DURABLE - They are constructed out of the highest quality of rubber polymer. They do not crack or deform under pressure or extreme temperatures. The heavy duty construction allows the mat to retain its shape. They are durable and long lasting. These mats are designed with an anti-slip backing. This helps to prevent the mats from slipping under pedals while driving. It keeps the mat in place as you get in and out of your vehicle. Easily customizable for a huge variety of make and model; cars, trucks, and suvs. 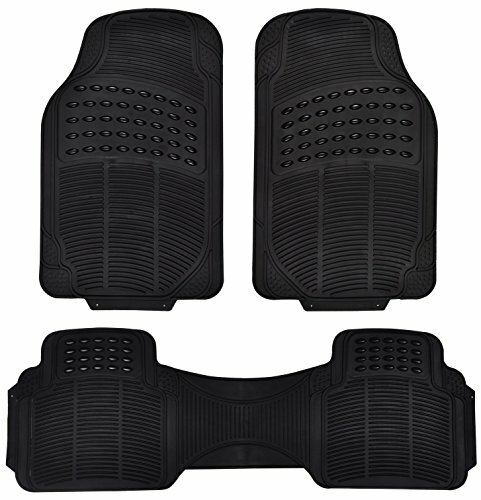 The front mats and rear mat have been specifically designed to fit the the most popular models on the road. Custom fit: universal mats are easily trimmed to provide a more custom fit. Just trim it with the regular scissor at home.